Linate airport also holds a two-decade old memento of Emporio Armani’s history: the vast signage installed over one of the hangars which bears the label’s logo, first raised there 22 years ago. (At the time, people reportedly thought Mr Armani had purchased the airport.) Since, the neon-lit sign has become symbolic of the brand’s indominatable position at the very top of Italian fashion and is often the first sight visitors see upon landing in the city. It made for a return of sorts – for the previous two seasons Emporio Armani has shown in Paris and London – and a celebration, over almost 200 looks for both men and women, of Armani’s lifelong love of travel. Here’s five things we learnt. Sportswear might have been intially designed for vigorous activity – but has since proved just as well-suited for doing nothing at all. What better, then, for long hours spent prone in an airport cabin at 40,000 feet? 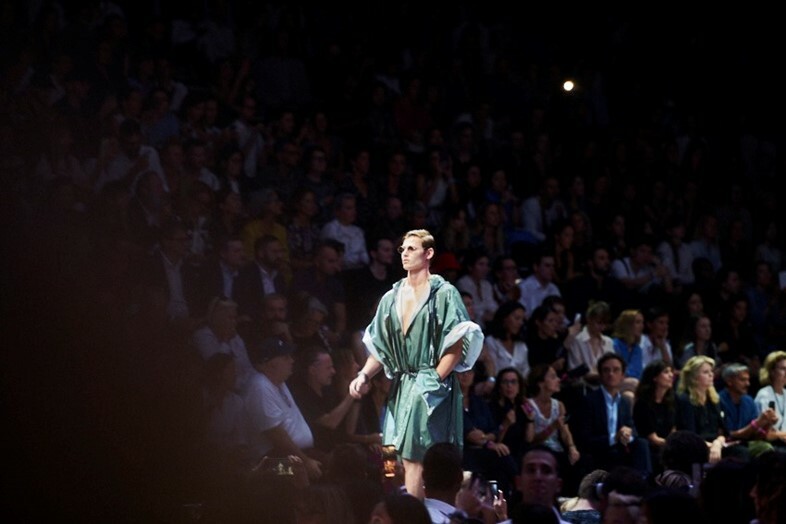 The S/S19 collection was a dictum from Mr Armani for comfort and practicality, of which sportswear happens to be both – proved by tech-y parkas, sheer basketball shorts and featherweight nylon pullovers which opened the show as part of EA7, the label’s sporty sub-line. (So lightweight were these pieces they fold away into impossibly small spaces, making them a more than desirable hand-luggage alternative to a Pac A Mac.) For those who remain unconvinced – one well-known designer previously deemed trackpants an “admission of defeat” – you are unlikely to find a piece of sportswear quite as decorous as the ruched parachute skirt of look four, which calls out for dramatic last-minute airport dashes. It is well known that elegant airport attire is sometimes all that’s needed to gain an upgrade from economy to first class – not that the Emporio Armani woman would ever find herself anywhere else. “Overall, it’s elegant – and less about street,” Mr Armani reported backstage, which meant alongside activewear pieces were a number of propositons for altogether more glamourous airport-wear – delicate semi-sheer gowns, coverings of iridescent paillettes, organza tailoring, lucite bangles and heavily embellished cocktail dresses all amounted to more than enough options for high-glam aeroplane exits. Practicality is of paramount importance to the frequent flyer. To this end, Mr Armani imbued this S/S19 collection with a distinct utilitarian streak. Worn across the body, slung over shoulders or strapped to backs, the collection’s multifarious hand luggage allowed for a hands-free walk through the cavernous Linate hangar – with some of the bags featuring straps rendered in Emporio Armani-branded seatbelt webbing-esque material. What’s more, utility belts boasting extra roomy pockets appeared around models’ waists, the kind of practical accoutrement that allows for easy access to travel documents and in-flight reading material alike. Diaphanous skirts and dresses were layered over trousers and underneath gauzy trench coats and waterproof parachute jackets in some of the collection’s louchest looks. The silhouette is loose and more floating than structured (all the more room for spacious pockets), enabling the Emporio Armani woman to layer without limits. And with such uninhibited layering comes ultimate comfort: the cushioning effect of numerous coverings is both sensible and snug for a long-haul journey. A number of models were sent down the Emporio Armani runway in groups or pairs alongside a corresponding look to their own, some completely identical and others more loosely matching. Silken neck scarfs, worn by both men and women, and similar suiting in linen and jacquard subtly recall the uniform of cabin crew (indeed, Mr Armani designed the workwear of Alitalia flight attendants in 1991), while two denim boilersuits offered a doubling up of the collection’s overall sense of practicality, and strapless jumpsuits rendered in slightly varying sandy hues were exemplary of S/S19’s easy elegance.